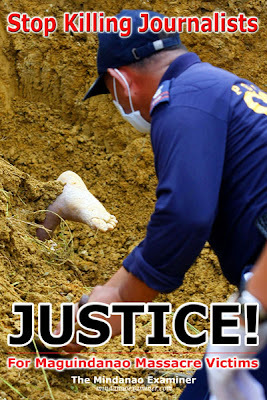 MANILA, Philippines - Filipino lawmakers on Monday called for the speedy resolution of the November 23, 2009 'Maguindanao massacre' that left more than 50 people dead, mostly members of media. "It has been one and a half years since the massacre, but the passing of that time has little to show for it. The trial has been dragging on and, meanwhile, journalists continue to be killed in the line of duty," said House Deputy Speaker and Quezon Rep. Lorenzo Tanada III. Tanada said the slow pace of the court proceedings on the massacre seems to be frustrating to the families of the victims. "Eighteen months later and we have yet to give justice to the tragic deaths. The fact that we cannot even start the hearings on the merits of the case is what’s frustrating to members of the families of the victims. The problem talaga is that lawyers have so much weapons to delay the process," he lamented in his speech during the 18th month commemoration of the carnage. Media organizations led by the National Union of Journalists of the Philippines set up an exhibit at the House of Representatives to commemorate the Maguindanao massacre. Tanada said efforts like the photo exhibit, that reminded the people of the tragedy, were significant in demonstrating vigilance in the fight for justice. "The depictions in this exhibit are not pretty, in fact they are terrible. But that is as it should be. We should have a daily reminder that it hurts." "These pictures, and this commemoration, serve as our compass. They are the emblems of our resistance against human rights violations...against impunity...against injustice," he said. "As long as we never forget, we keep justice within reach... Our homage to the victims is our mark of vigilance," he added. Authorities said 58 people, including members of the Mangudadatu clan and their supporters, were killed in Maguindanao's Ampatuan town while on their way to file the certificate of candidacy of Esmael Mangudadatu, then Buluan town vice mayor eyeing the Maguindanao gubernatorial post. The journalists were just covering the filing of Mangudadatu's candidacy. At least 198 people, including primary suspect former Datu Unsay Mayor Andal Ampatuan Jr., clan patriarch former Maguindanao Mayor Andal Ampatuan Sr., his son former Autonomous Region in Muslim Mindanao Governor Zaldy Ampatuan, former Shariff Aguak Mayor Datu Anwar Ampatuan, former Vice Governor Datu Sajid Ampatuan, and former Mamasapano Mayor Akmad Ampatuan, are currently being tried for multiple murder charges in relation to the gruesome massacre. Speaker Feliciano Belmonte Jr. said lawmakers are wondering too about the progress of the case. "After 18 months, the House is asking, too, what happened to the case? We are one with the families and supporters of the victims in seeking justice," he said. Belmonte said he hopes that justice would soon be served to the families of the victims to ease their pain of losing their loved ones. "I am thinking what made people like Datu Unsay think they can do it. Let’s say the area there was dominated by warlords, but then we have innate humanity. What gave them the mindset that they can commit such murder?" he said. Belmonte said the House of Representatives will do everything it can to help the victims of the massacre and to ensure that the carnage will never happen again. "Karamihan sa amin dito ay nababahala talaga. We vow not to forget and to do everything we can," he said. Meanwhile, families of the victims of the Maguindanao massacre called on the government to allow them to conduct surprise visits on the detention facility of the members of the Ampatuan clan. The families, who organized themselves into a group called "Justice Now!," and the NUJP said they will submit their letter of request to the Department of Interior and Local Government (DILG) and the Department of Justice (DoJ) amid reports that the powerful clan has been getting special treatment while in detention. Rowena Paraan, NUJP secretary general, said Justice Now! and NUJP have received reports that the Ampatuans are getting special treatment and are enjoying perks while in detention such as having their own helpers, catered food, air-conditioned room, and use of cellular phones. Reports have also reached them that the Ampatuans were also able to leave the facility in the company of jail guards, according to Paraan. "If somebody like (former Batangas Governor Antonio) Leviste can get out of jail anytime he pleases, then it’s not far-fetched that it happens also to somebody like the Ampatuans, who are more powerful and wealthy than Leviste," she said.